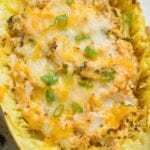 Healthy Buffalo Chicken Spaghetti Squash Boats are a tasty keto, gluten free dinner. Low carb, cheesy + loaded with spicy buffalo sauce – they’re delicious! 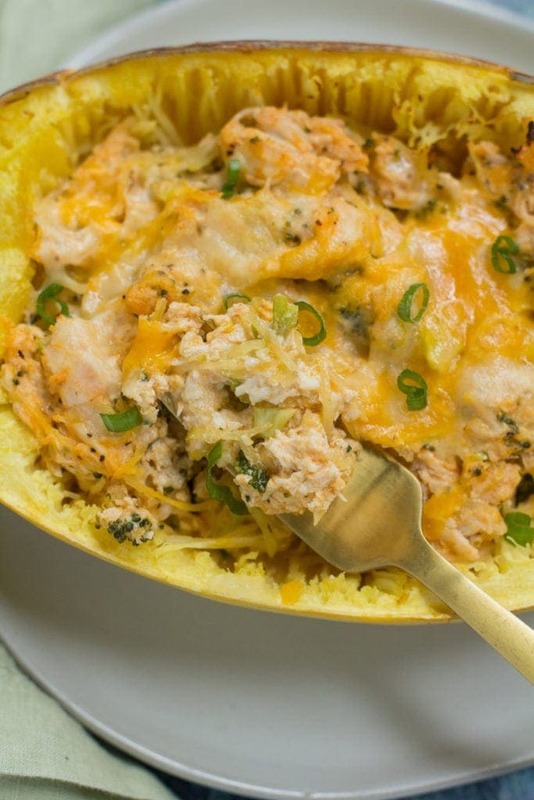 Healthy Buffalo Chicken Spaghetti Squash Boats are the ULTIMATE fall meal. 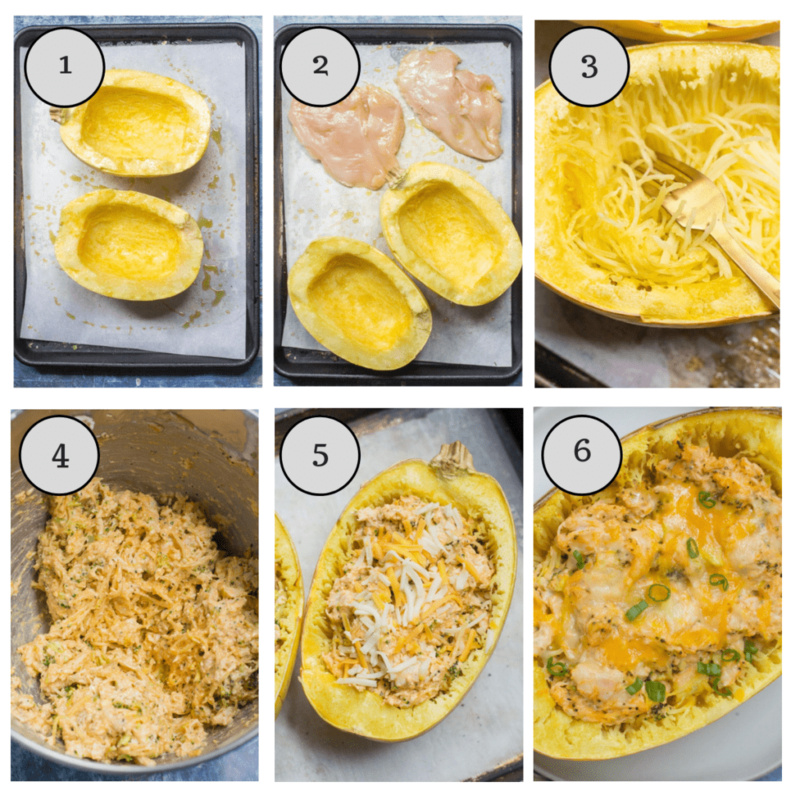 These spaghetti squash boats are great for when you need a simple dinner that requires minimal effort or for meal prepping! 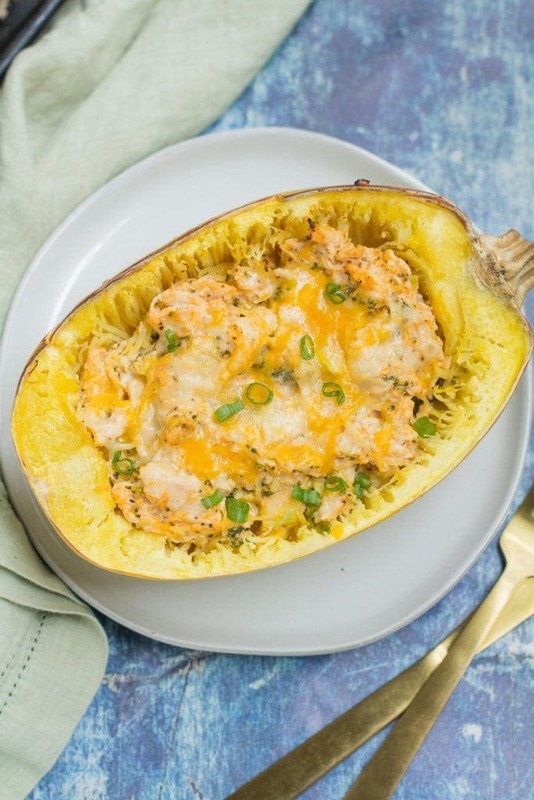 Keto, gluten free, and low in carbs – these buffalo chicken spaghetti squash boats are definitely going to be a hit with your family! These spaghetti squash boats are one of those meals that every time I make them, I ask myself why didn’t I make this sooner?? Simple ingredients, minimal time, and down right delicious. A win win in my book. This recipe is also great for using up leftovers. So if you have leftover grilled chicken, you can use that.. or other random veggies (brussels, green beans, etc) those will work too. I created this recipe pretty much entirely out of my love for all thing’s buffalo chicken related. You know how the Frank’s Red Hot Bottle says put that *** on everything ? That’s me and Tyler. Eggs? Throw some hot sauce on it. Soup a little bland? Add hot sauce. Take-out doesn’t taste as good as you expected? Get the hot sauce. Cook the spaghetti squash before. That takes the longest. Wondering how do you cook a spaghetti squash in the microwave or instant pot? Here is a post on how to cook spaghetti squash in the microwave and here is a post about how to cook spaghetti squash in the instant pot. Both methods take about 10 minutes. You can also just bake the spaghetti squash per the directions in the post at 400 for 30 minutes total. You can bake it the night before you want to have them for dinner and shred so that you’re 30 minutes ahead of the game come dinner time! Cook the chicken ahead of time. You have a few options for shredded chicken. You can make my Easy Instant Pot Shredded Chicken, you can cook the chicken in the crockpot (you’d have to do it the day before or in the morning) OR you can say whatevs and just buy a rotisserie chicken and shred it up.. any method will work. My favorite thing to do is prep everything per the directions up until step seven. Then I just wrap the spaghetti squash boats and put them in the fridge for a few days so I can just take the out and bake for 12-15 minutes until the cheese is melty and they’re warm throughout! 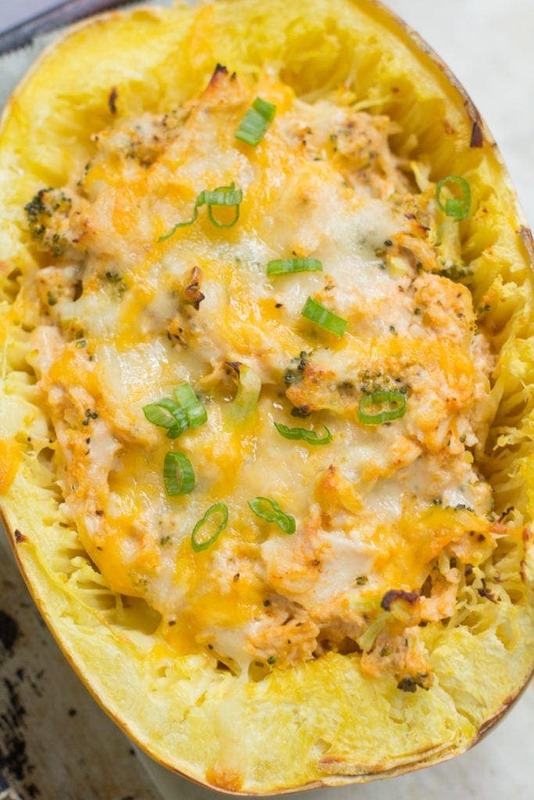 Can I make these Buffalo Chicken Spaghetti Squash Boats paleo or whole30? This recipe is tricky to make paleo/dairy free. Instead, I’d try this recipe for Healthy Buffalo Chicken Spaghetti Squash Casserole. You can leave out the blue cheese crumbles and it will be totally paleo, whole30 and dairy free. (It’s also a little less work because you can just dump it in the pan and bake it! Looking for other dinner inspiration? Try these recipes! These Healthy Buffalo Chicken Spaghetti Squash Boats will be your new favorite gluten free dinner. Low carb, cheesy + loaded with spicy buffalo sauce - they're easy and delicious! Preheat oven to 400. Prepare a lined baking sheet with parchment paper or a silpat baking sheet. Spray sheet with olive oil. Slice the spaghetti squash lengthwise, remove seeds + place on baking sheet. Spray the spaghetti squash with olive oil and place open face up (see photos). Bake in the oven for 10 minutes. After 10 minutes, remove the sheet from the oven and add whole chicken breasts to the sheet. Spray chicken breasts with olive oil and return to the oven. Bake for 20 minutes. While the spaghetti squash is cooking, mix together broccoli, cheese, hot sauce, yogurt + pepper. Once the spaghetti squash is cooked, shred by pulling at the center with a fork. Remove about half of the squash from the skins. Shred chicken by pulling apart with two forks. Add shredded chicken and and shredded spaghetti squash filling to the the veggie/cheese/yogurt mixture. Cook the spaghetti squash before. That takes the longest. Wondering how do you cook a spaghetti squash in the microwave or instant pot? Here is a post on how to cook spaghetti squash in the microwave and here is a post about how to cook spaghetti squash in the instant pot. Both methods take about 10 minutes. You can also just bake the spaghetti squash per the directions in the post at 400 for 30 minutes total. You can bake it the night before you want to have them for dinner and shred so that you're 30 minutes ahead of the game come dinner time! My favorite thing to do is prep everything per the directions up until step seven. Then I just wrap the spaghetti squash boats and put them in the fridge for a few days so I can just take the out and bake for 12-15 minutes until the cheese is melty and they're warm throughout! I love Frank’s and Buffalo flavoured everything! This is right up my alley , I’ll have to try them out! LOL I love laziness too 🙂 I needed some new inspiration for spaghetti squash – I always just make spaghetti with it. BORING! Honestly… I usually do the same thing! it’s so easy! But I’m trying to be a little bit more creative! Oh wow, that looks sooo good! Drooling over here! Thanks, Ivan! They’re super cheesy and delish! You should try them! Do you Cook the broccoli first or use raw??? Thanks! No, the broccoli is raw. It should be chopped per the directions in order for it to cook correctly! Finally made this recipe after seeing it on Instagram and I’m obsessed! I put franks on everything and this is a guilt free dinner that I now make almost once a week. You would never know that there is greek yogurt in this, tastes just like buffalo chicken dip, but even better! This is my FAVORITE spaghetti squash recipe that I have come across! We love franks red hot at my house and I was convinced there just wasn’t going to be enough of it in this recipe so I added more than the recipe called for… boy was I wrong! My mouth was on fire.Trust Liz and Tyler with this one and follow the recipe as is. I promise you won’t be disappointed. This has been added to our regular dinner rotation. I’m so glad you like it, Jonna!! It definitely is spicy, lol!! This is such a perfect twist on a classic!! Loved the flavors and didn’t feel guilty for indulging 🙂 Perfect fall recipe. So glad you liked them, Sammie!! I’ve just made this up for dinner tonight in an effort to eat healthier. I personally love the filling in the squash but my boys will think it’s tooooo healthy therefore will go into the meal thinking it’s gross. Have you ever baked this outside the skin or in an 8×8 pan? Would you suggest changing the cooking time? This is so delicious! Was the perfect healthy dinner. Thanks! I’m so glad you liked it, Santini! I’m serving this up for dinner tonight! This looks so good! Thank you for the recipe! So glad you like them, Liane! Enjoy! This was insanely delicious! I love broccoli but was uncertain about it in this recipe – wow, were my reservations wrong! Gives the dish great crunch to offset the chicken. Definitely going in our regular rotation! I’m so glad you liked it, Kate!! And that you enjoyed it with the broccoli – I like the added crunch it gives too 🙂 If you like buffalo – these Healthy Buffalo Turkey Meatballs are also really yummy!